Among Harvard's thousands of daguerreotypes, researchers will find this ca. 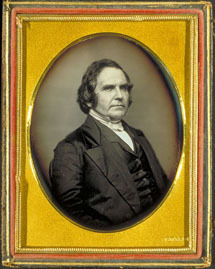 1840 image (photographer unknown) of John Langdon Sibley, a Harvard alumnus of the Class of 1825, who served as the Harvard College Librarian from 1856 to 1877. Sibley's image is among the holdings of the Harvard University Archives. Digital image © 2007, the President and Fellows of Harvard College. Used with permission. This month, D-Lib features the Harvard University's Library Collections to the World. Second International Conference on Digital Information Management ICDIM 2007, 28 - 31 October 2007, Lyon, France. Call for papers. The submission deadline is 15 June 2007. Workshop on Web Personalization and Recommender Systems, held in conjunction with the 2007 IEEE/WIC/ACM International Conference on Web Intelligence (WI'07) and Agent Technology (IAT'07), 2 - 5 November 2007, Silicon Valley, California, USA. Call for papers. The submission deadline is 20 June 2007. 10th International Conference on Asian Digital Libraries (ICADL 2007), 10 - 13 December 2007, Hanoi, Vietnam. Call for papers. The submission deadline is 25 June 2007. 9th ACM International Workshop on Web Information and Data Management (WIDM 2007) , 9 November 2007, Lisbon, Portugal. Call for papers. The submission deadline is 26 June 2007.
International Journal of Digital Libraries (IJDL), Special Issue on Very Large Digital Libraries (VLDL). Call for papers. The submission deadline is July 1, 2007.
International Journal of Internet Research Ethics, (IJIRE). Papers are now being accepted for the premier issue of the IJIRE, which is scheduled for October 2007. World Library and Information Congress: 73rd IFLA General Conference and Council "Libraries for the future: Progress, Development and Partnerships" 19 - 23 August 2007, Durban, South Africa.